A young, unmarried, pregnant woman in 1950s Arkansas faces an uphill climb in Keenan’s (In Those First Bright Days of Elvis, 2016) follow-up novel. It’s 1957, and Elvis is still gyrating his famous hips. While Julie Morgan continues to trade letters with the handsome rock star, her life in El Dorado has become increasingly different…and difficult. Following the death of one friend and the betrayal of another, Julie struggles to reconcile her feelings toward the in crowd. To further complicate matters, she has a love-hate relationship with her half sister and look-alike, Carmen. But Julie’s social struggles all become secondary when she realizes she’s pregnant. She can’t continue to reside in El Dorado, pregnant and unmarried. She won’t settle for a marriage of convenience to the baby’s father, and her mother wants her to move to a home for unwed mothers. To avoid suspicion, Carmen delivers a solution straight out of The Parent Trap. Julie heads to the misleadingly named Happiness House to deliver her baby while Carmen assumes Julie’s identity. Neither Carmen nor Julie is prepared for the difficulties. While Carmen struggles to convince Julie’s family and friends that she hasn’t changed, Julie can’t decide whether she will keep her baby or give it up for adoption. 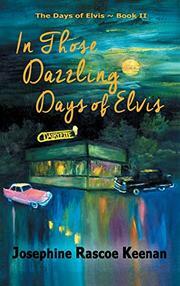 Keenan’s second Days of Elvis novel continues Julie’s coming-of-age story. It’s satisfying to watch her begin to realize her own independent thoughts and feelings and even experience early stirrings of feminism. The author touches on potentially difficult issues—divorce, infidelity, pregnancy, and abortion—and does an admirable job portraying the often inconceivable repercussions of now commonplace experiences in a small, Southern town in the ’50s. Carmen and Julie take turns narrating, and the dialogue toggles smoothly between their two distinct voices. It’s interesting to watch Carmen navigate the complicated social hierarchy in El Dorado, but Julie’s story truly drives the narrative. A convincing glimpse into the challenges of navigating small-town gossip, social pressure, and the inevitable difficulty of becoming an adult.